At Hot Dog Yoga we have one very simple vision in mind. We are all about all kinds of yoga, for all kinds of people to feel good 365 days of the year. So, we have created a studio for everyone, with a good vibe and great premium yoga experience. 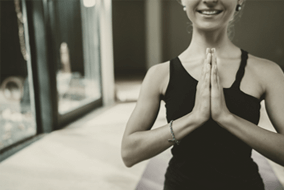 From hot vinyasa to flowing vinyasa, to power yoga and restorative classes. Restorative yoga is a form of yoga that seeks to achieve physical, mental and emotional relaxation. A restorative yoga sequence is supported by props that allow you to completely relax and rest. Calming and rejuvenating, you will experience deep, passive stretching whilst relaxing your nervous system. Come and quieten your over stimulated mind. Leave feeling peaceful & balanced with full body relaxation. A slower paced style of yoga with postures that are held for longer periods of time. A more meditative approach to yoga, yin aims to cultivate more of doing less, and a perfect complement to more active forms of yoga and exercise. Leave feeling calmed, balanced. A total de-stress of body & mind. A flowing sequence of postures in a non-heated room that brings together breath and movement. Get the mixture of strength and cardio without losing the essence of yoga. The steady cycle of inhales and exhales provides you with a calming, mental focal point. Vinyasa works your entire body in union. Feel your body build strength, more toned & flexibile. A physically challenging cardio workout, co-ordinating movement with breath from one pose to the next that calms the mind. The practice itself is like a moving meditation that creates internal heat, a purifying sweat that detoxifies muscles and organs, while improving circulation. Feel improved mental focus, flexibility, core endurance and muscle strength. Iyengar yoga is one of the more traditional types of yoga and holds tremendous powers to benefit and heal the body. By paying close attention to anatomical details and the alignment of individual postures, Iyengar is the yoga of precision. 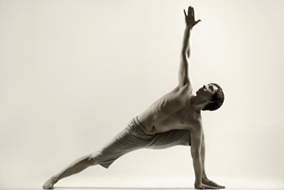 Poses are held for long periods and often modified with props, increasing flexibility and muscle tone. A typical class will leave you feeling mentally and physically balanced. A bit more power and energy than hot Vinyasa. Moving quickly, an intense workout that will make you sweat, increase stamina and improve flexibility. This type of practice involves synchronizing the breath with a continuous flow of postures that will get your heart rate up. A full body cardio workout where you will detox, get fit and tone. Leave with more energy and vitality. A dynamic & flowing vinyasa style sequence to help build strength and flexibility while having a good detox. Hot Vinyasa improves circulation and metabolism, and strengthens the cardiovascular system. Leave feeling Re-energized in your body and less stressed. Bikram’s twenty-six posture exercises systematically move fresh, oxygenated blood to every part of your body, restoring all systems to healthy working order. You will gain muscle tone, vibrant good health and a sense of well being. A heated Bikram class is designed to scientifically warm and stretch muscles, ligaments and tendons. A great way to detox, relieve stress and heal. It also improves strength and circulation. This is a class for you to experience the vibe at Hot Dog Yoga. Come and learn what yoga is all about in a friendly environment where everyone is welcome to come and try, with zero judgement. Learn about the basic yoga poses and get a feel for what is to come as you develop your yoga practise. Harness the power of your body and mind & bring clarity and balance to every aspect of your life so that you can live the life you want. Our meditations aim to get you unplugging, re-energizing and getting your brain in an optimum state, to remain calm and focused every moment of every day. 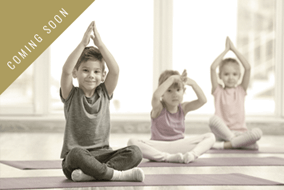 Yoga for children is a form of yoga that is designed specifically for children. It includes poses to increase strength, flexibility, and coordination. Classes are intended to be fun and may include age-appropriate games, animal sounds and creative names for poses. Kids yoga improves focus and concentration bringing mind, body and heart balance to children through the use of exercises, breathing techniques and relaxation skills.